What would a major political convention in America be without a Kardashian? Answer: Boring. Kim Kardashian, who’s never been one to tout her own personal political beliefs all that much, decided to head to Charlotte, North Carolina, last night. Why? She was planning to attend a major after party for the Democratic National Convention! Is there some federal law that requires that a Kardashian has to attend any and all after parties nationwide? That might be it. Either way, Kim Kardashian took to her Twitter account on Thursday night to let everyone know what she was doing and where she was heading. Kim tweeted, “This is how we do…. 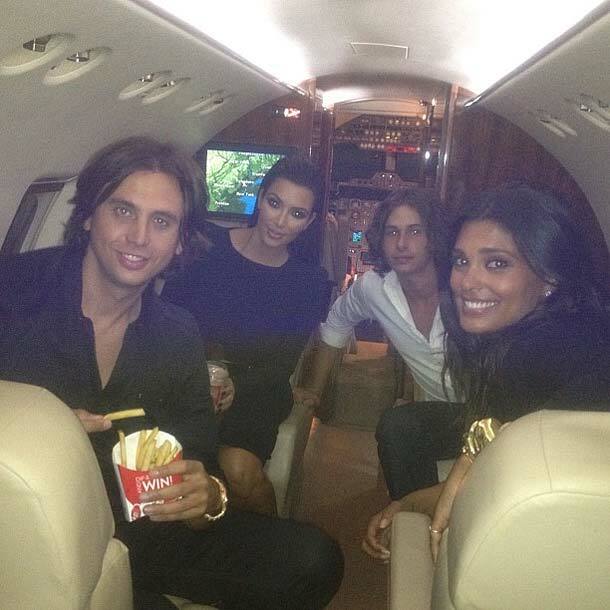 Private plane & Wendy’s! DNC party here we come.” She attached a photo of her on board the plane, with what looks like a Wendy’s Frosty in her lap. Who are her companions? According to reports, Kim was accompanied on the Charlotte-bound flight by her friends, designer Rachel Roy and Jonathan Cheban. It was a really busy evening for Kim Kardashian. She left for Charlotte and the big DNC after party right after she attended Fashion’s Night Out in New York City. It seems for Kim, politics is equally as important as fashion.